The Red Sea, also known as the Gulf of Arabia, is a sea between the Arabian Peninsula of Asia in the northeast and Africa in the southwest. It is a part of the Indian Ocean. The Red Sea is about 2200 km long, but its width is less than 330 km. Many ships go through the Red Sea, because the Suez Channel connects the Red Sea to the Mediterranean Sea and Bab-el-Mandeb at the opposite end is a gate to the Indian Ocean. Ports of the Red Sea are, for example, Suez, Port Sudan, Massawa, Yanbu al-Bahr, Jeddah, Aqaba and Eilat. It is named that because it sometimes looks red from the red algae. The water of Red Sea has more salt and is clearer than water of most other seas because almost no rivers run into it. The weather is dry and warm around the Red Sea and for this reason many people from Europe and other parts of the world come for their holiday to the Red Sea. Some of them are divers, who swim under the sea level, to see rich coral reefs and fish. 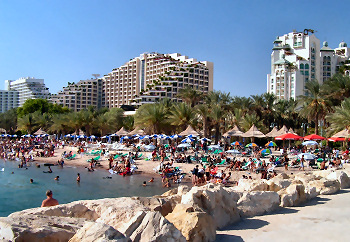 Holiday places, for example, are Sharm el-Sheikh, Eilat or Hurghada. The countries next to the Red Sea are Egypt, Sudan, Eritrea, Yemen, Saudi Arabia, Jordan and Israel. 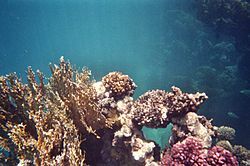 Red Sea Facts for Kids. Kiddle Encyclopedia.